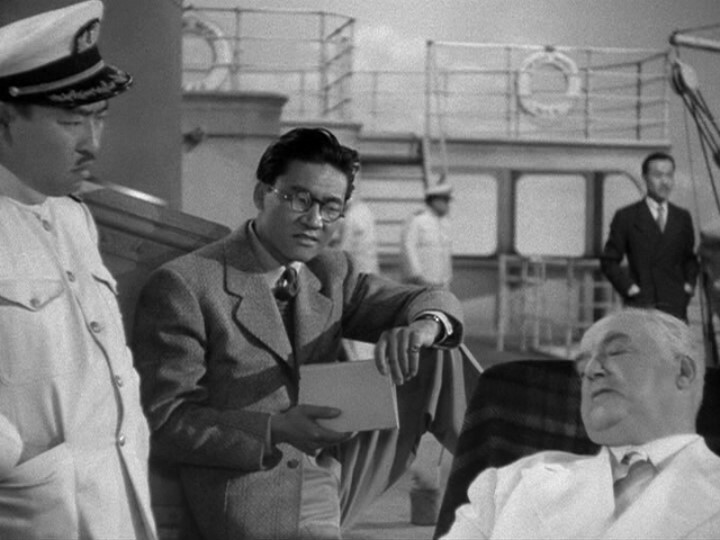 Sydney Greenstreet (right) impresses his friends with his vocabulary. In our opinion, the best movie villain is a real smarty pants. There’s nothing worse than a bad guy you can easily outsmart; otherwise, what would be the point of getting out of bed? This is precisely why we think Sydney Greenstreet is the perfect villain. He narrows his eyes when he scrutinizes you, he laces his capacious vocabulary with dry wit, and he keeps your glass filled with liquor. Plus, he wears those impeccably-tailored white suits that look really expensive. A perfect example of Greenstreet at work is the adventure-war flick Across the Pacific (1942). Greenstreet is a mysterious passenger on a Japanese freighter in the days preceding America’s active involvement in World War II. He has aligned himself with the Japanese, and is suspiciously keen on gathering information on American military activities in the Panama Canal. Greenstreet’s fellow passengers include Humphrey Bogart, who plays an army captain freshly discharged for embezzlement, and the delightful Mary Astor, a young woman who claims she’s from Medicine Hat, Canada. Across the Pacific is one of those movies where everyone lies about their true identity, and for a while you’re scratching your head, wondering who’s a traitor, who’s a spy, and who’s a sucker. It’s also a film where a lot of people end up getting shot. In addition to that, we the audience are subtly reminded that the Pearl Harbor doomsday clock is ticking. We see cables and other paperwork with dates inching closer to December 7, 1941, which adds another layer of urgency to the plot. Not surprisingly, this is a film that does not portray the Japanese in a positive way. But at least these characters are given credit for having intelligence and are not reduced to mere caricatures. We love Sen Young’s dynamic performance as a second-generation Japanese-American. We also love watching Greenstreet and Bogart verbally duke it out on screen. Greenstreet is smooth and urbane, draping complex sentences around the scene like a garland. Bogart is cynical and tenacious, his staccato speech bursting like gunfire. They couldn’t be more dissimilar, and the chemistry couldn’t be better. Our man Greenstreet had a short but impressive Hollywood career. He made 24 movies in eight years, including The Maltese Falcon, Casablanca, and the charming Christmas in Connecticut. His career is even more remarkable when you realize that the whole time he was suffering from diabetes and chronic nephritis (Bright’s disease). Across the Pacific is a good yarn with a clever script and superb direction. It also seems, to us, a plausible scenario in the few short weeks prior to the attack on Pearl Harbor. We want to publicly thank our friends at Film Noir Blonde for sending us this terrific DVD. If you’re not already following FNB, well then! Make haste and check it out! Across the Pacific: starring Humphrey Bogart, Mary Astor, Sydney Greenstreet. Directed by John Huston and Vincent Sherman. Written by Richard Macaulay. Warner Brothers, 1942, B&W, 95 mins. I really like this film and both Bogie’s and Greenstreet’s performances. And Bogart has great chemistry with Mary Astor, following The Maltese Falcon – they should have been a team! Bogart, Greenstreet and Astor do have great chemistry, don’t they? They are so much fun to watch. I love the scenes with Bogart/Greenstreet together – two pros playing off each other and they do such a perfect job of it. Thanks for dropping by! Ruth, ACROSS THE PACIFIC is one of my favorites, in large part because I love the cast, many of them alumni of THE MALTESE FALCON! Bogart, Astor, Greenstreet, Sen Young – what’s not to love? Thanks for the info about Greenstreet’s health issues. Poor Sid, living with any chronic illness is no joke. (Having said that, I can’t help thinking about an old S.J. Perelman quip: “I’ve got Bright’s Disease, and he’s got mine.” I’m so wicked, please forgive me on Sid’s behalf! Then again, maybe he’d laugh, too. But I digress….) Now I’m even more impressed with his performances in the face of adversity. Great post, Ruth, as always! I was more impressed with Greenstreet, too, when I learned of his health issues – especially when you consider how many movies he was making in his heyday. You are so right. Sydney Greenstreet was divinely and urbanely villainous. His hilariously arch rendering of John Huston’s brilliant dialogue in “The Maltese Falcon” ( “I am a man who likes talking to a man who likes to talk…”, etc.) is irresistible. Mary Astor’s hair is an interesting point. During her early career in the ’20s, she wore it very long, full and and lush. Then it was bobbed. and later still (“The Great Lie”) she sported a ultra-moderne mannish style. Her face was stunning but it seemed her hairstyles sometimes diverted from her classic features. I haven’t seen “Across the Pacific” for a while, but have always enjoyed it and all the films that Greenstreet made with Bogart (and Peter Lorre – 9 films!). Thanks for an entertaining look at one of the great character actors of the Golden Age and one of his standout films. Oh yes, I love Greenstreet in “The Maltese Falcon”. The way he says his lines – terrific! What a great team he and Bogart and Lorre were. Pure magic. Oh wow, I have to see this! It’s going to be an instant favorite, I can already tell. What a cast! Of course, you had me at Humphrey Bogart, but I adore everyone else in the cast too, so I’m looking forward to seeing this. I’m having such a great time discovering the movies you write about. I’m LOLing at your Mary Astor digression. I’ll be watching for her hair, lol. This is a real fun and nicely written piece, Ruth! I too adore Greenstreet and couldn’t agree with you more re: preferring a witty, worthy villain. ACROSS THE PACIFIC is an enjoyable wartime thriller, though I’m far from Mary Astor’s biggest fan. Greenstreet and Bogart did have a peculiarly effective chemistry, for sure. My favorite Greenstreet roles are in THE MALTESE FALCON and his smaller but extremely entertaining part in CASABLANCA. i definitely need to see more of Greenstreet’s films with Peter Lorre, especially THE VERDICT where they’re both on the side of good for a change. I have never seen “The Verdict” but I agree that it would be interesting to see them on the “right” side of the law. But would it be as much fun…? Greenstreet is such an enjoyable actor. Every time he is in a movie (whether he is a villain or not) I want to root for him. Christmas In Connecticut will always be my favorite Christmas movie because of Greenstreet and his hilarious performance. I also love to see him and Bogart together which fortunately they did quite often. Thanks for the great post. I love Christmas in Connecticut. Greenstreet is pitch-perfect, as always. Yes, he and Bogart are perfect foils. Such a treat to watch their scenes. Across the Pacific is pretty good movie, right up until the climax when Huston decides to make it ridiculously convoluted. Greenstreet was at his best when paired up with Peter Lorre though – their films together are enormous fun. The Mask of Dimitrios is simply terrific. Greenstreet and Lorre were a terrific pair on screen, weren’t they? I’ve never seen “The Mask of Dimitrios” – thanks for the recommendation! And thanks for visiting. Enjoyed this posting a lot. Greenstreet is fabulously evil starring opposite Joan Crawford in ‘Flamingo Road’, one of his last films – I also remember loving ‘Passage to Marseille’, another film featuring several members of the cast of ‘Casablanca’, including Bogart, Greenstreet, Lorre and Rains. That one does get a bit confusing at times because it has flashbacks within flashbacks within flashbacks, but still a great film! Ha ha – glad I’m not the only one!